To start exploring the DVD feature, click the Media tab in the Resource Area. Then, click the DVD icon in the Media List (see illustration below). There are three icons across the bottom of the DVD clip library. Click this icon to open the DVD Clip Editor window and create a new DVD clip. Click this icon to add a new DVD clip, edit or delete a selected clip, customize the thumbnail view, customize the clip sort order, or refresh your clips. Click this icon and use the slider to customize the thumbnail view in the DVD clip library. To access the DVD Clip Editor, right-click anywhere in the DVD clip library section and select Add New DVD Clip... from the pop-out menu, or click the Add New icon. 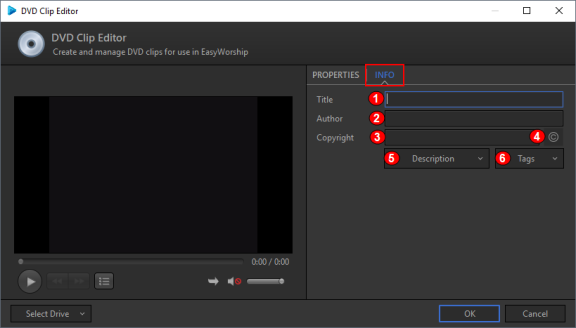 If a DVD is in the DVD drive when the DVD Clip Editor window pops up, EasyWorship will begin playing the DVD just like a normal DVD player. Using your mouse, click the chapter menu in the preview window and navigate to the desired chapter or segment. 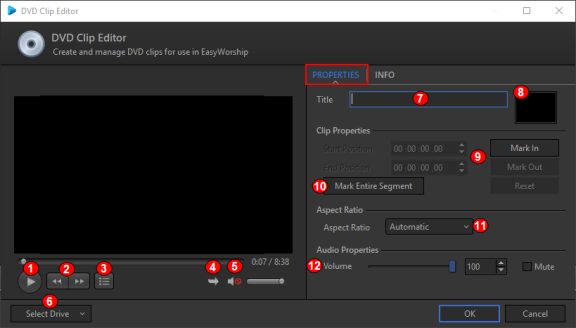 The DVD Clip Editor gives you a number of options for selecting clip segments and adjusting clip volume. Play / Pause: The play/pause button starts and stops the video playback. Fast-Forward / Rewind: Single clicking skips forward or backward one chapter. Holding the FFW or RWD buttons down will fast forward or rewind the video. Menu: Allows you to access the DVD Title Menu, Root Menu, set subtitle options, Audio options angle and load the chapter menu. Continuous Play / Repeat: Allows you to loop the DVD clip you are viewing or let it stop at the end of the clip. Mute & Volume: Controls the audio while working with the DVD clip. The audio will not be muted on playback. Select Drive: Select the DVD drive that currently has a DVD disk in it. This is automatically selected if you only have one DVD drive. Title: Type the name of the DVD clip in this field. Clip Properties: Start Position is the time at which the DVD clip will start. Use the up and down arrows to manually adjust the time. Mark Insets the start position of the DVD clip. Click this button as the DVD clips plays to set the start position. End Position is the time at which the DVD clip will end. Use the up and down arrows to manually adjust the time. Mark Out sets the end position. Click this button as the DVD clips plays to set the end position. Reset simply resets the Start and End Points. Mark Entire Segment: Selects the whole DVD, or in the case of an iWorship DVD, selects the start and end point of the song you are currently viewing. Aspect Ratio: Allows you to maintain the aspect ratio, stretch or zoom the video. Audio Properties: Allows you to change the volume of the DVD clip when you go live with it. The volume slider allows you to set the volume of the DVD clip for playback to the audience. Mute allows you to mute the audio on the DVD clip if you don’t wish to use the audio portion of the DVD. Title: Enter the name of the DVD clip in this field. Copyright: Enter copyright info in this field. ©: Adds the copyright logo to the copyright field. Description: Enter a description for the DVD clip. Tags: Enter tags for the clip.